Dr. Steven Reff uses his extensive experience to provide the highest level of surgical care in a gentle, compassionate manner. He received his D.D.S. (Doctor of Dental Surgery) degree from the University of Maryland School of Dentistry. While there, he graduated at the top of his class and was honored by his faculty by being inducted into the Gamma Pi Delta Prosthodontic Honors Society. He also served as President on a variety of committees including the Dental School’s Global Outreach Program and Oral and Maxillofacial Surgery study group. 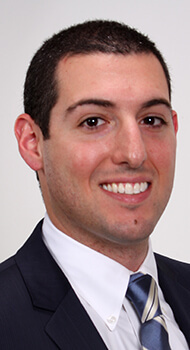 Following dental school, Dr. Reff completed his cosmetic and surgical-based training at Columbia University College of Dental Medicine/New York Presbyterian Hospital. Upon completing his training Dr. Reff began treating patients in private practice. He was also invited to take a position at Columbia University College of Dental Medicine teaching postgraduate candidates and future dentists. Dr. Reff is a Fellow of the International Congress of Oral Implantologists, a credential he received after completing three years of intensive, hands-on oral implantology training. Dr. Reff is proud to be joining Dr.’s LaCap and Tong at their offices in Tappan and Bergenfield. When he is not practicing dentistry or attending professional obligations, he enjoys hiking with his Yellow Lab, fly fishing, and relaxing with his wife Allison and their two children, Mackenzie and Preston.